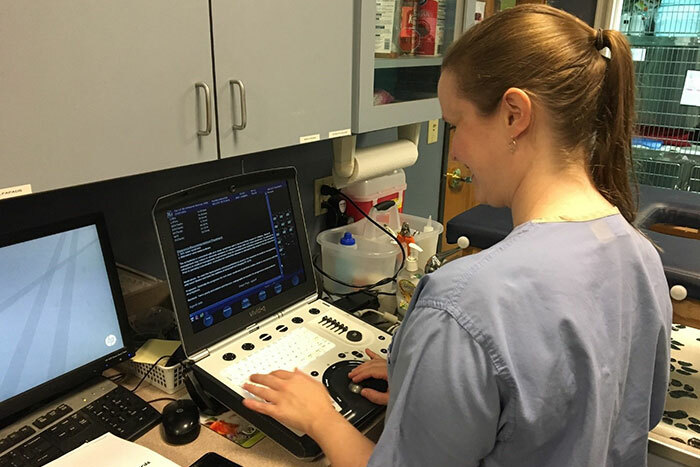 Dr. Melissa Tropf reviews information on her portable ultrasound machine as part of the cardiology extension service that PVM offers to veterinary clinics in the greater Indianapolis area. 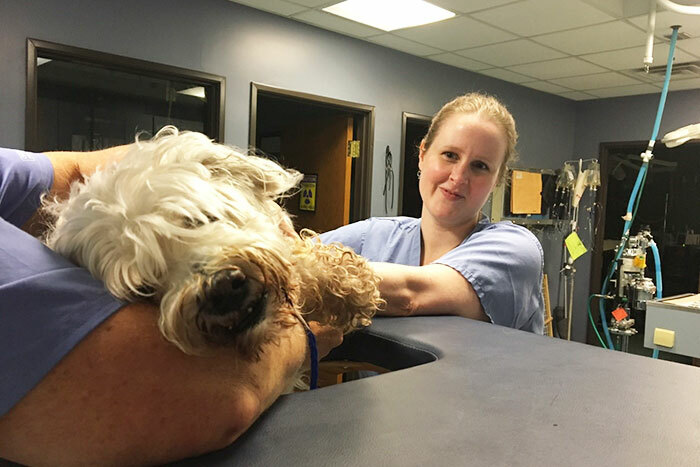 On a rainy Friday morning, Dr. Melissa Tropf, Purdue Veterinary Medicine clinical assistant professor of cardiology, pulled a small, portable exam table and a computer out of the trunk of her car, and walked into Noah's Animal Hospital in Indianapolis. There she met Willie, her first patient of the day. Willie is a small, elderly shelter dog from Indianapolis that was having problems fainting when he got too excited. Since traveling more than an hour to the Veterinary Teaching Hospital at Purdue University for cardio diagnostics would test Willie's physical limits, Dr. Tropf came to him. After a short visit, she provided Willie and his veterinarian with a definitive diagnosis and an individualized plan of care to help alleviate his symptoms and get him into a permanent home. "We find that lots of dogs and cats have heart disease, both congenital and acquired heart diseases, and many families are unable to travel to Purdue for various reasons," said Dr. Tropf. "We looked at different forms of outreach and found that it's better for the animals and their families to provide outstanding client and patient care by traveling to them." Dr. Daniel Hogan, Purdue Veterinary Medicine professor of cardiology, worked with Dr. Tropf to design the extension service to meet these needs for small animals in Indianapolis, the largest metro area in Indiana. Twice a week, they travel to veterinary clinics in and around the I-465 beltway and utilize their portable diagnostic equipment and specialized training to help veterinarians by diagnosing and planning treatments for their patients. Animals, just like their human counterparts, suffer from heart disease which can have serious and sometimes fatal consequences. While it's possible for a pet to live for many years without showing symptoms, heart disease will progress over time and affect other organs as well. A pet that has an individual treatment plan focused on heart health stands to have a longer and more comfortable life than one without. After finishing her write up for Willie, Dr. Tropf packed up and traveled across town to the IndyVet Emergency and Specialty Hospital to see Dylan, her next patient. Dylan is a large, 15-year-old tabby cat owned by Purdue alumna Heidi Klein, an IndyVet veterinarian who completed a Purdue Veterinary Medicine ophthalmology residency in 2010. Dr. Klein noticed some changes in Dylan’s behavior last year, which led to a diagnosis of a heart murmur with early signs of kidney dysfunction. She contacted the cardiology extension service for help managing concerns about side effects from Dylan’s medications. After a short visit, Dr. Tropf shared with Dr. Klein full diagnostics and a comprehensive treatment plan for Dylan. "Our goal," said Dr. Tropf, "is to provide veterinarians with a comprehensive, individualized written assessment, including diagnosis and findings, additional testing that should be done, and any treatments and medications that are recommended." 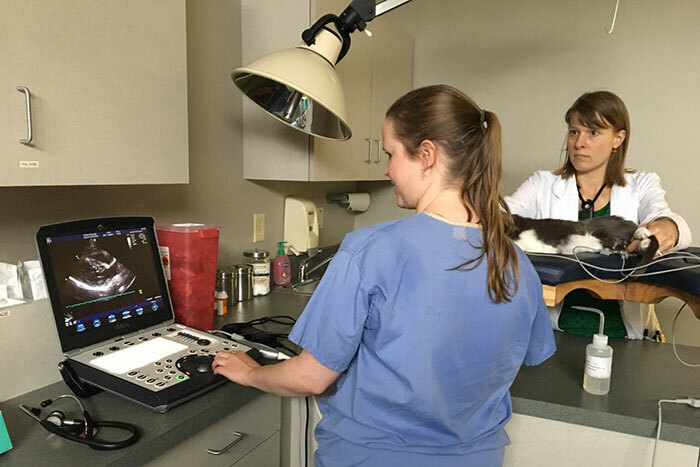 Veterinarians interested in the PVM cardiology extension service should contact the Veterinary Teaching Hospital Referral Help Desk at 765-496-1000 for more information and to set up an appointment. Willie, an elderly dog suffering from fainting spells, lays on the portable cardiology table so Dr. Melissa Tropf can begin a diagnostic assessment. Dr. Melissa Tropf looks at an ultrasound of Dylan’s heart. 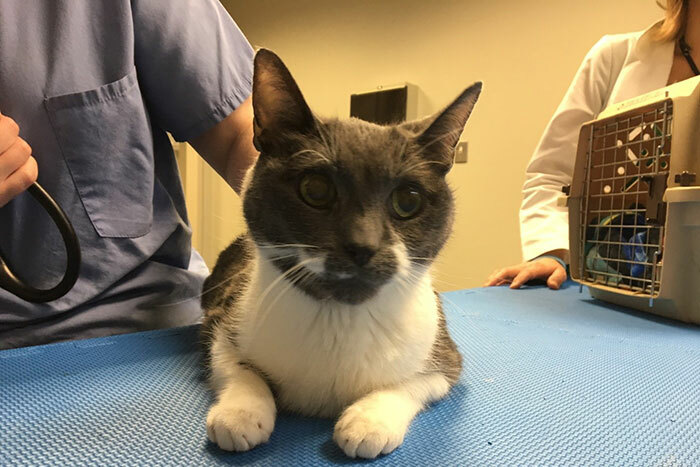 Dylan, a 15-year-old cat with early signs of heart disease, is held in position by his owner, Dr. Heidi Klein of Indianapolis, who completed a PVM ophthalmology residency and works at IndyVet. Dylan looks sprightly after his cardiology exam, conducted as part of PVM’s cardiology extension service.